South Africa coach Peter de Villiers heaped praise on his side after they produced a battling display to beat Australia 44-31 in their Tri-Nations clash in Pretoria. The defending champions weathered an early storm from the Wallabies - who lead 14-0 and 21-7 in the early stages of the first half - to snap a four-game losing streak and notch their first win of this year's Tri-Nations. "I was worried when we gave them those tries, especially in the state we were in, the confidence being low," the Springbok coach said. "So to give them a start like that it took really a lot of heart and character to come back and win a game a like this." After the below-par opening that saw James O'Connor and Will Genia cross for Australia, Juan Smith and Gurthro Steenkamp cut the deficit either side of a second O'Connor effort, before Dean Mumm and Pierre Spies exchanged tries to hand the visitors a 28-24 half-time lead. But the Wallabies could only manage three points after the break as Frans Steyn and JP Pietersen crossed to seal a hard-fought victory. 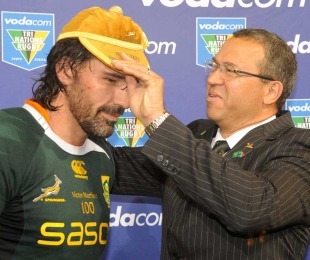 The game also marked the 100th cap for veteran lock and vice-captain Victor Matfield on his home ground Loftus Versfeld, and De Villiers continued, "I think the guys wanted to do it for themselves, do it for Victor and do it for their country. So that on its own was obviously enough motivation for them to go out there and play." De Villers, whose side were edged out 29-22 at the death by New Zealand seven days ago, also praised his side for their determination. "They felt bad at half-time, but they weren't down. They knew that they messed up in the first half, but they also believed they could still do it and you saw the turnaround after that. That (guts) is what the team is made up of. I think now we can build on this game, use it as a foundation, working towards the World Cup." Opposite number Robbie Deans was satisfied with the way his side played in their bid for a first ever win in Pretoria. "It was obviously a game we could have won, even though we haven't won here previously. So the opportunity was certainly there." However, he felt they were undone in certain areas and also lamented the loss of key players Nathan Sharpe and Scott Higginbotham through injury. "We went missing when it really mattered, particularly set pieces. Obviously losing Sharpie didn't help and Higginbotham in the warm-up didn't help either. But that just seems to be the way things are running for us to that end at the moment. "There was a lot that was constructive and good for us, so we'll be hoping for better next week." The two sides meet in Bloemfontein in seven days' time.